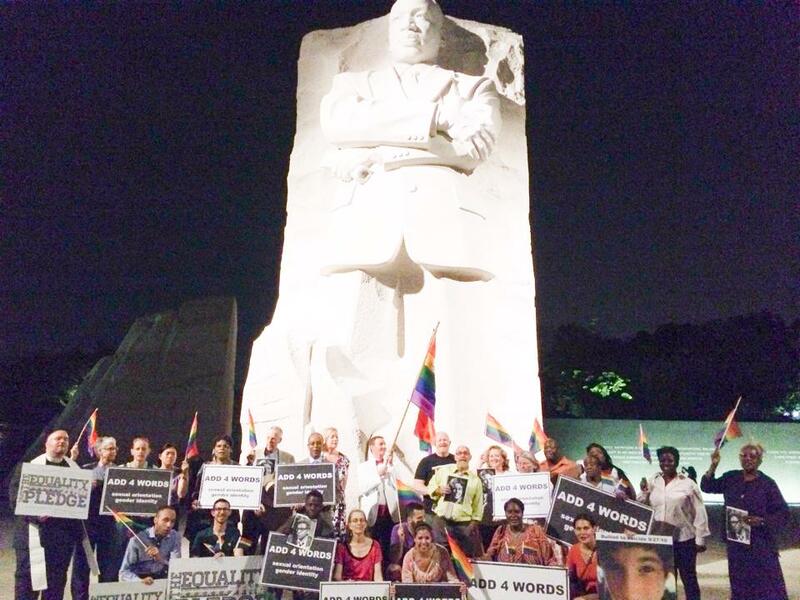 Washington, D.C., Monday, June 30, 2014 – The Equality Pledge Network made a united call for full LGBT (lesbian, gay, bisexual, and transgender) equality at a vigil for LGBT civil rights at the MLK Jr. Memorial Monument. The vigil included a variety of speakers from, LGBT activists, African American leaders, and faith leaders, who gave speeches, prayers, and sang several songs in tribute to fallen LGBT people, all calling to “ADD 4 WORDS” to the 1964 Civil Rights Act. The vigil marked the 50th Anniversary of the signing of the Civil Rights Act by President Lyndon B. Johnson on July 2, 1964. “Those who are equal before God shall now be equal in the polling booths, in the classrooms, in the factories, and in the hotels, restaurants, and movie theaters, and other places that provide service to the public,” said President Johnson as he signed the Civil Rights Act. The Equality Pledge Network is calling on Congress and the President to add four words to that Act, “sexual orientation and gender identity.” Adding those words would ban discrimination against LGBT Americans in housing, public accommodations, education, employment, and federally funded programs. “It’s time for a sexual orientation and gender identity civil rights act. I loved visiting the President in the White House, sitting in a top White House official’s briefing for 3 hours. I totally loved it. I also loved holding a civil rights vigil at the MLK Jr. Memorial with the LGBT community. But, dream or imagine if you will a bill to address civil rights laws and adding sexual orientation and gender identity to them all? That, I’ll love most of all,” said Richard Noble, LGBT activist who walked across the nation for equality. “The inclusion of LGBT Americans in the Civil Rights Act of 1964 is right and necessary. As an African American woman, I understand why only fully inclusive nondiscrimination laws meet the standard for basic human dignity in our nation,” said Veronic Eady, an Equality Pledge Network board member and human rights attorney. Currently, there are no such federal laws. The Equality Pledge Network is a new nationwide campaign calling for full LGBT equality, it reflects a growing determination to press forward vigorously for full and equal human rights. The campaign is supported by over 240 organizations in 44 states and D.C., these organizations represent the full array of advocacy, direct action, faith-based, statewide, local, marriage, immigration, pride, transgender/gender non-conforming, community centers, and other community constituencies. “Everyone needs to get in the fight for full federal equality. Our youth should not have to grow up in a society where some are valued more than others,” said Stephen Zollman, Equality Pledge Network Northern California State Lead. “As queer people and as activists, the pledge means something to us on both a personal and organizational level. We believe every person deserves these rights, and ignoring them condemns LGBTQ people to live as second-class citizens,” Ashley Martian, organizer with the Black Cat House. 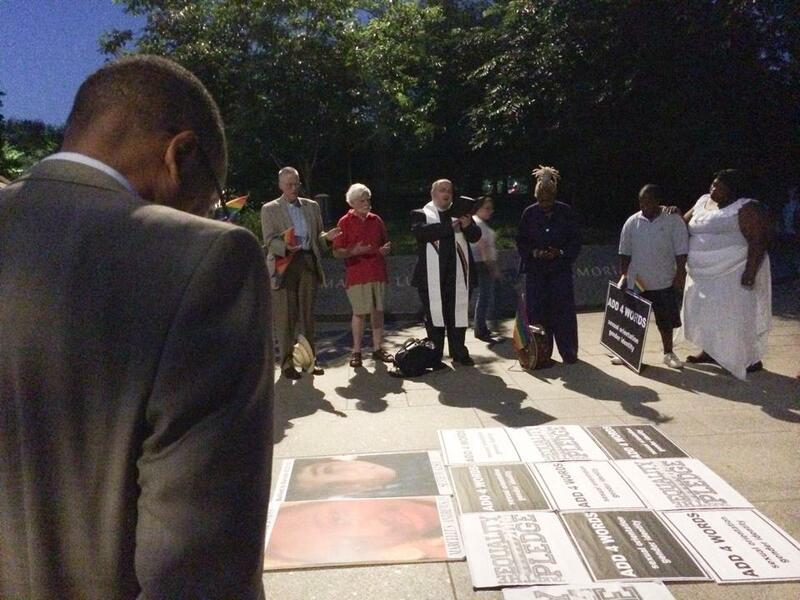 At the vigil, Rev. Dr. Dennis Wiley, a straight-ally African American leader on LGBT justice from Covenant Baptist UCC spoke about the interconnectedness of all struggles, as faith leaders proclaim the spiritual imperative to protect LGBT Americans from discrimination. Transgender rights advocate, Consuella Lopez, from the D.C. Mayor’s LGBT Advisory Board spoke about the horrific suffering of transgender Americans, from homelessness to suicide. Attendees also held pictures of LGBT children who committed suicide because of the anti-LGBT bullying and harassment during the vigil. There were several other speakers at the vigil in addition, Cindy Bray, Treasurer of LGBT Democrats of Virginia; Dr. Robin H. Gorsline, of People of Faith for Equality in Virginia; Dr. Dana Beyer, a recent state Senate candidate in Maryland who spoke on behalf of Gender Rights Maryland; Rev. Abena McCray, co-founder of Unity Fellowship Church; and Richard Noble, who walked across the nation on foot for equality. There is no bill in the U.S. House or U.S. Senate at this time to move forward full LGBT equality. There are several bills that would provide LGBT equality piece by piece. If you would like to join the cause or take the Pledge for Full LGBT Equality please go here: Join the Cause! Previous Vote Blue in 2014! Vote for Change!